This is Jill Knouse. And she does love you. From the moment she meets you. If you’ve ever come to one of her classes at Yoga Pearl in downtown Portland, you’ll sweat and jam, but more, you’ll probably get a hug, eye contact, a smile. Genuine interest in your life. You will never feel more welcome in a yoga class. Jill spoke to me about her “upbringing’ in the yoga world. It didn’t start all that long ago. Up until 2004, she was in the financial world in San Fransisco, living the Corporate “American Dream”. She told me that suddenly, she just started needing change. “If I didn’t make a shift, I was going to die,” she said. Now Jill’s business is her passion, and she is keeping more than busy. She teaches yoga at Yoga Pearl, and runs her two programs that she has created: her own Yoga Teacher Training program, as well as Elevate Yoga Trainings, her mentorship program for yoga teachers wanting to take their teaching to the next level. I asked her to speak to me about what it was like being a “salesperson” of yoga. How is she able to keep her passion alive for something that she has to sell to people all day? Her answers? What makes my business thrive is that I don’t come at it from that side. It comes from a place of wanting people to heal. To soften scars. To heal their bodies physically and emotionally. I want to help people reduce suffering. and show compassion. That’s what I have to offer. These scars aren’t immune to her, or anyone else. Possibly the greatest thing about a conversation with her is that she isn’t trying to pretend that she has it all figured out. 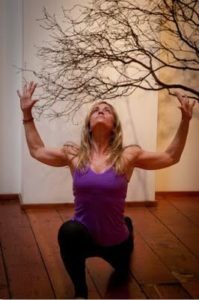 If you want to come practice radical acceptance, learn a thing or two about yoga and truly connect with a joyful soul- don’t miss an opportunity to practice with Jill Knouse. Just the smile will make it worth it. Learn more about Jill’s offerings at the conference here.